After the war all but a very few towns didn't need to erect monuments to record their fallen, the Mirfield War Memorial Fund Committee purchased Ings Grove House the former home of Dr Uriah Bradbury (whom Doctor Lane was named after) along with its substantial grounds as a memorial to Mirfield's fallen. The House would become the town's new clinic and the grounds the Memorial Park where the war memorial would be erected comprising of a cenotaph in the form of an impressive lime stone cross backed by a wall displaying six bronze panels containing the names of the fallen . 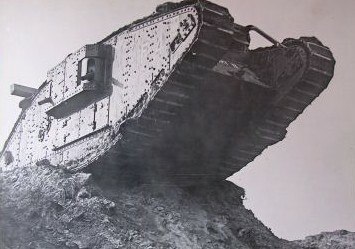 In thanks for efforts made by the public by the purchase of bonds the Treasury deemed that 264 towns were to be presented with a retired tank, those towns would be chosen by the National War Savings Committee to reflect the contribution they had made. The Military delivered these tanks with a great deal of pomp and ceremony, the presentation itself being made by some high ranking officer to the local dignitaries. Mirfield received an Mk IV female tank. The female version was a machine gun equipped tank while the male was equipped with two adapted naval 6 pounder guns. It was located alongside the war memorial in Ings Grove Park. Although the presentation tanks, as they became known, were initially welcomed by many towns and cities this wasn't to last. Many were at a loss at what to do with them. Many local war memorials, including Mirfield's, were of a totally non-military nature where a towns lost generation of young men were remembered and those who survived the conflict often strived to forget. The presentation tanks sat rather uneasily in this environment many being quietly moved from their initially prominent locations to rust in the shadows as the play things of local children. Ironically the outbreak of WWII sounded the death knell for most of them when the Government's call for scrap metal for the war effort gave the ideal excuse for their disposal. Mirfield's tank it seems met this fate, maybe to be reincarnated for a forthcoming battle.